Assalam ‘alaikum, sisters! Subhan Allah, we are fast approaching the end of 2018. You, like many others, may be reflecting on how the year has unfolded. Are you on track with your goals? Are you feeling a sense of calm or are you overwhelmed? It is quite possible to be experiencing the latter, especially if you have a lot on your plate and the previous months didn’t quite go as you had planned. Sometimes life throws challenges our way and we draw on our faith to get through them, but we may still feel a little bit anxious or off balance. Alhamdulillah, Allah’s creation is dynamic; everything is moving and sometimes life moves at a pace with which we feel we just can’t keep up. In reality, whether we are keeping up or not, what really impacts us is our perception: how we experience ourselves and our life. How you gauge yourself is what determines your quality of life, doesn’t it? If you sense that you are coping with things, then you may well experience a sense of calm and balance. If you feel that you can’t keep up, then feeling overwhelmed follows. Reflect on a time when a few stressful things were going on simultaneously. How well did you handle them? Perhaps you were dealing with things on the outside (to others), but inside you were feeling depleted. Did you crave a sense of calm and peace? Perhaps you did. 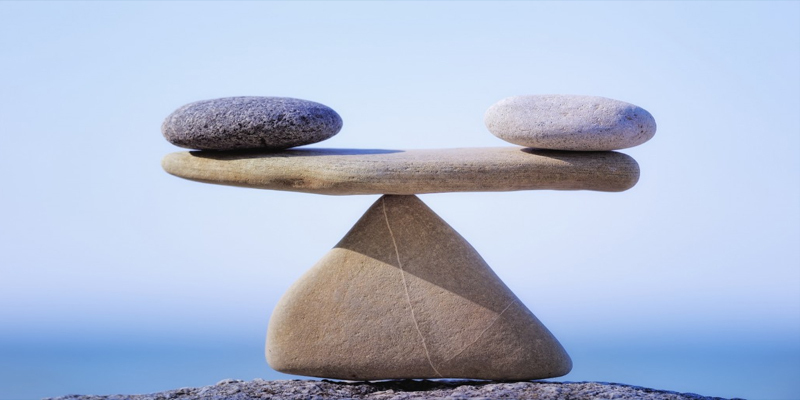 We need to experience a sense of balance and calm in order to be truly productive. Indeed, some people thrive on the energy of last-minute deadlines – of taking action, but that isn’t sustainable over a long period of time. Human beings need to come back to a sense of balance in order to experience life as joyful and fulfilling. So, let’s explore what balance means and how to regain our balance when we feel we need to. Begin with the following exercise in order to clarify your personal definition of balance. If my life were in perfect balance, what would I see, hear, feel and experience that would tell me that my life is in balance? There is no right/wrong definition. Feel free to adapt your definition to what works for you. Once you are clear about what balance looks like in your life, go ahead and utilise the tips that appeal to you if you feel that you need to reclaim your sense of inner wellbeing. Are you busy from morning to night? If you are spending your days giving your energy to others without replenishing your reserves, you are bound to feel out of balance. You may feel very anxious and overwhelmed if you are giving, but your tank is running on empty. If you find yourself feeling exhausted, perhaps frustrated or even resentful, this is a clear sign that your energy reserves are running low. We aren’t just talking about physical energy here; we are talking about emotional energy and mental drive. These are often the ones that we are unable to replenish. So, if you attempt to regain balance while juggling your schedule, the attempt will probably be futile at this point. Stop, take a breath and focus within. What you will need to do is to carry out some self-care, even at the most basic level. Take a few minutes to do some deep breathing (as often as possible), make sure you are eating and get as much sleep as you can. Do something small to re-fill your heart. Focus on prayer, sitting still or even talking to a loved one. Focusing on building your inner energy will help you to deal with the challenges a little bit more effectively. Make self-care a priority, at least for a day or two, and feel the difference. Take time to figure out which of your relationships feels the most out of balance. It may be that you need a little more time to reflect on your life or perhaps to pray. It may be that a conflict remains unresolved or that you may be feeling guilty for not giving a loved one enough time. First, identify which relationships need a little special attention. Next come up with one or two things that you will do to regain balance in that area. Remember, if there is an unresolved conflict, it will result in anxiety if not dealt with, so find a way to get into conversation and resolve the matter – you’ll be glad you did. Next, deal with any issues within your physical environment. Clutter, disorganisation or having too many tasks pending can also lead to a great deal of anxiety. Either scratch the tasks that seem unrealistic or schedule things in a digestible way. As long as you’re moving forward with things, you should find your sense of inner wellbeing returning. Do you feel that you have to multi-task? Most sisters say that they would love to do more, if only they had the time. Multi-tasking on a regular basis means that you are forcing your attention in different directions. In addition, your mind will not be in the moment; without realising it, you are thinking about the next thing and the next. These patterns will lead to shallower breathing, more movement and perhaps going into fight-flight mode without realising it. We don’t often realise it, but life is lived in the moment. You can’t repeat the past and you can only live into the future through the present. If you find yourself feeling off-balance, then rest assured that you are living away from the present. The first step is to reduce the multi-tasking. Focus on one task at a time. If you need to, set yourself a small chunk of time for each task. It is more effective to chunk things down into digestible bits than to do many things at once. Give it a go and you will notice that you will find yourself calming down over time. We all face challenges managing our time and our wellbeing, given that we want to do more with our lives, alhamdulillah. We hope that these tips will provide you with a few tools that you can use in order to regain your balance. Insha Allah, we hope that we can all be productive and live our lives with wellbeing.